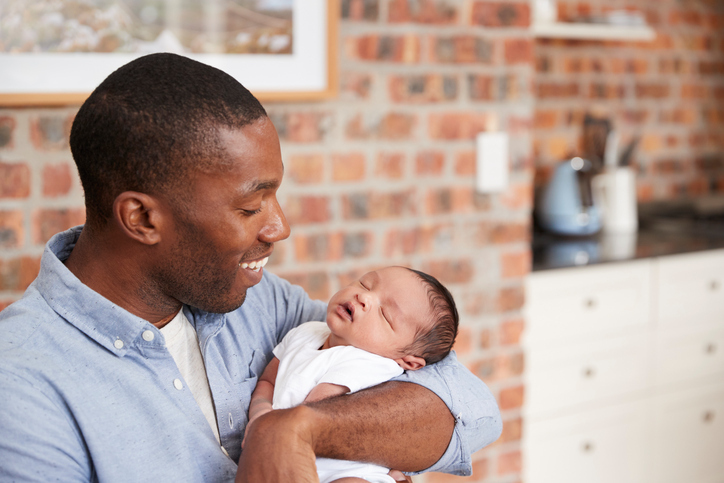 While much of the first few weeks of newborn care will lie squarely on your shoulders, try to grab every chance you can to get dad involved, too. You’ll not only give yourself a much-needed break but also allow him to bond with the baby. Right from the beginning, give dad a regular job: Ask him to take over bath or diaper duty, or make him burpmaster. It might not even save you time, but give him as many chances as possible to participate anyway. He'll get to spend quality time with the baby, and later, when you’re ready to head out of the house for some much needed me time, you won't be getting texts every few minutes asking which way the diaper goes on. Plus, a little break can do you good, especially when it’s a middle-of-the-night diaper change. Moms know how quickly a breast can pacify a screaming, inconsolable infant. Dads don’t have this handy tool, so try to make sure that when you’re handing off your little one in these early weeks, she’s content – or even asleep. You’ll have plenty of time to ease Dad into more challenging moments. Once your partner has settled into his parenting duties, let him enjoy baby time by himself. That’s right - no hovering, nit-picking or criticizing, even if you really do know best. While you’re probably relying on your mommy instincts, he needs to let his daddy ones kick in, so give him the space to figure things out. He might just discover a better way of doing things, and if not, a backward diaper never hurt a baby. Just be sure to add laundry duty to his honey-do list. It’s great to have dad participate in the menial tasks of babydom, but he and his newborn need quality time, too. Skin-to-skin touch is important for both of them, so encourage dad to spend time shirtless while he’s holding (or wearing) the baby. They’ll bond - and you might find some fantastic photo and video opportunities. Your little one needs to hear the sound of Papa's voice, too. During those few, precious awake hours, remind dad to talk to the baby – even spouting off last night’s sports highlights in a sweet voice will do the trick.